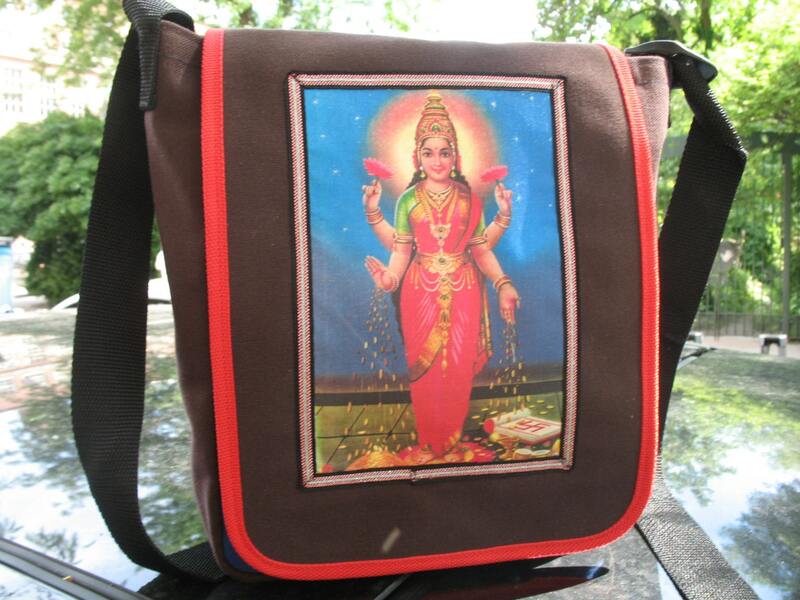 Our Canvas Daybag with a appliquéd ribbon trimmed image of the hindu goddess Lakshmi. Lakshmi is the Hindu goddess of wealth, fortune, and prosperity (both material and spiritual). This messenger style bag is made from heavy duty cotton duck canvas and features one interior pocket and a larger exterior pocket under the flap. A velcro closure secures the flap of the bag to the body keeping your belongings safe. There is a 1.5" polypro adjustable webbing strap so the bag can be worn over your shoulder or across the body.